Livadiya Palace in Yalta was the home of failed emperor Tsar Nicholas II, who was ousted in 1917 and executed by communist revolutionaries in 1918. The seaside palace was also where Roosevelt, Churchill and Stalin drew up plans for post-World War II Europe. Friends are so full of helpful advice and encouragement. Why am I going to the Ukraine, why traveling there on a Russian ship, and why taking Anneliese with me? I’ll only find bad food, they said, hopeless poverty, corrupt Soviet-style bureaucracies and hole-in-the floor toilets. And we’ll probably have a brush with the Russian Mafia.Their depressing predictions didn’t include the Ukrainian revolution that was yet to come. However, I had my reasons for going.So, for better or worse, last October my wife, Anneliese, and I found ourselves in the Ukrainian port of Yalta, on the deck of the MS Kazan, a Russian cruise ship out of St. Petersburg. Our cruise was to start in Yalta, call next on Sevastopol and then Odessa. Afterward, the Kazan would carry us to ports in Romania and Bulgaria and end in Istanbul, but Odessa was my real goal. I can’t speak a word of Russian, and to make matters worse, I had learned that our fellow passengers, other than Anneliese and myself, were all Austrian – and I don’t speak German. However, Anneliese, who was German-born, promised to be my translator, and her sister and brother-in-law from Vienna, who accompanied us, luckily spoke English too. Standing on the Kazan’s top deck, the October sun felt warm on our backs, but we had to hold tightly to our jackets against the stiff breezes coming from the Black Sea behind us. Looking toward shore, the heavy surf crashed against the rocky seashore, from which Yalta’s steep mountains rose. The lower mountain slopes were dotted with weather-beaten palaces of Russia’s old nobility, mixed with new hotels, concrete sanitariums and the Ukraine’s golden onion-domed Orthodox churches.Exploring on shore, we found Yalta’s narrow streets lined with pointed cypress trees, southern magnolias and, surprisingly, palms. 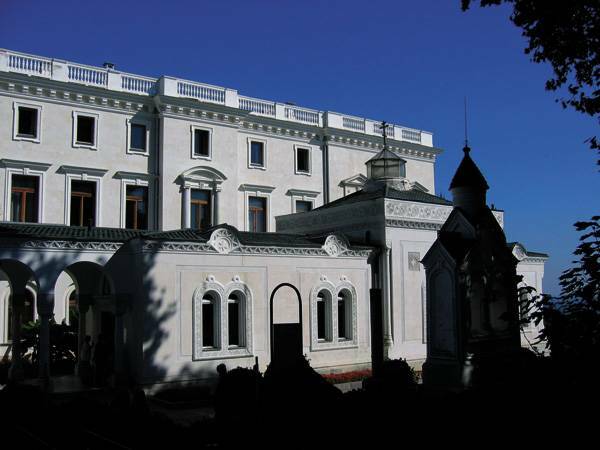 We found the old estate of the Emir of Bokhara, a statue of famous playwright Anton Chekhov, new gambling casinos, and some newly restored private palaces – owned by Ukraine’s new rich, we were told.For me, the most interesting feature of Yalta was the Livadiya Palace, which from 1911 to 1914 was the seaside residence of Tsar Nicholas II, his Empress Alexandra and their five young children. Livadiya was a pillared, white Italian Renaissance-style palace with state meeting rooms on the first level and the Tsar’s private family quarters on the second floor.Tsar Nicholas II was a disastrous failure as an emperor. However, he was said to have been a dedicated family man; the restored private quarters on the second floor held many photos of his family gatherings, picnics and tennis games, and copies of his children’s drawings. In July 1918, the communist revolutionaries executed the whole family, including the four beautiful young princesses and the 14-year-old Prince Alexis, a tragic hemophiliac. In February 1945, the Livadiya Palace held Roosevelt, Churchill and Stalin, who, seated around the huge round table in the downstairs vestibule, argued, plotted and horse-traded to settle the future of the postwar world. Back onboard ship, I questioned Cruise Director Nicolaus Richard about Odessa, where we were to soon to call. Nicolaus, an affable Austrian who had studied hotel management at Cornell University, had once lived in Odessa. He told me in perfect English that the Ukraine was struggling against a severe economic depression, had few rich and many poor, and suffered under a hopelessly corrupt government. However, he said, the people are just great, especially the Odessans, who are cheerful and uncomplaining. Odessa is an old, culturally rich, cosmopolitan, multiethnic city, he said, and he loved it.I told him that my father had once lived in Odessa, where he became an unwilling witness to the Russian Revolution. I wanted to visit that Odessa scene, which held a deep family meaning for me. We’ll talk more about this, Nicolaus said, but now I must go about my duties. Cruising on, I learned that our ship, the Kazan, was built in Italy in 1999 and was chartered by Austrian River Cruises of Vienna. She was small, with only four decks, a maximum of 147 passengers and staff of 53. The Kazan was clean, modern and smoothly run, and Anneliese found our cabin (of about 250 square feet) to be snug and comfortable. The short and energetic Russian captain, Boris Rybkin, had close-cropped white hair. He would appear without warning anywhere about the ship, striding rapidly in deep discussions with his officers. It was my brother-in-law Freddy who had recommended this cruise. Freddy, with his yachting jacket, white Vandyke beard and erect bearing, looked every inch the retired merchant marine captain that he was. Hannah, his wife, was a forthrightly spoken woman, lively and cheerful, who spoke excellent English. Taking our early morning workout on the Kazan’s upper deck, Anneliese, Hannah and I breathed in the invigorating sea breeze as we sailed into Sevastopol’s harbor. Before us were lines of gray warships – with, Freddy said, the Ukrainian warships anchored on the port’s left and the Russian Black Sea Fleet on the right.Downtown Sevastopol rose above the harbor, its main street lined with classic beaux-arts-style, gray stone buildings. All the public buildings and parks were neat and clean, but the stores and offices were stained and shabby, as were many homes on side streets. This city was nearly destroyed in World War II, after a heroic defense against the Germans.We took an excursion into Sevastopol’s backcountry, driving on good two-lane roads nearly empty of traffic. Between the wooded hills, the quiet and shabby country towns held big ramshackle apartment blocks dating from Stalin’s era. We drove through the lush valley of Balaklava, covered now by hundreds of rows of champagne grapes. In this valley in 1854, during the bloody Crimean War, the famous Light Brigade of British cavalry made their disastrous charge against the Russian cannons. In Tennyson’s famous poem:Cannon to the right of them, cannon to the left of them,Into the jaws of Death, rode the six hundred Dinner that night was at 7:30 in the ship’s comfortable Tchaikovsky Dining Room. Our fellow passengers were gray-haired, solidly middle-class Austrians – very polite, reserved, heavy smokers, and to my eyes neither fashionable nor dowdy. Anneliese called them the “Metamucil crowd.” Our dinner table held an agreeable Austrian couple. Our server, Lena, who became a favorite of Anneliese, was a shy beauty, quite intelligent, and had just graduated from Odessa’s law school. No jobs for her onshore, we were told. Kiev is Ukraine’s capital city, but Odessa is Ukraine’s main seaport. The Kazan waited outside the port to pick up the pilot, a bald, muscular man, casually dressed, who climbed quickly onto the Kazan’s bridge next to our neatly uniformed captain. Leaning intently forward, he pointed out the course. We sailed past the white lighthouse and entered the gap in the long breakwater protecting the inner harbor. This immense port was crammed with dozens of ships and forests of huge cranes.Freddy pointed out ships for me. Far to the right was a Russian Volga River cruise ship, he said. To the left were a Greek ship unloading containers, many grain cargo ships, a small cruise ship – the Island Sky, out of Nassau, Bahamas – and the huge Prinsendam, out of Rotterdam, an immense, white, multistoried cruise ship. I told him that Anneliese and I did not like the big cruise ships, which in our experience were dedicated to continuous food, Las Vegas-type entertainment and heavy shopping.Hopping onto the dock, we climbed up Odessa’s long and impressive Potemkin Steps crowded with gypsies, souvenir vendors, guitarists, and brides and grooms being photographed. At the top, we strolled along the superb Seaside Boulevard, a majestic tree-shaded promenade lined by magnificent 19th-century town palaces built for Russia’s old nobility.We wandered through Central Odessa, where Freddy’s knowledge of basic Russian became quite an asset. Odessa was full of old mansions and palaces, some in first-rate shape as museums, hotels, offices or apartments, but mostly stained, peeling and badly run-down. The gorgeous old opera house, world-renowned, was fortunately being renovated. Odessa must have been a very sophisticated city before the Russian Revolution of 1917, and something still remained of the old cosmopolitan aura, in spite of today’s poverty. Odessa’s streets were fascinating – full of restaurants and cafes and crowded with university students, good-looking young men and women, neatly dressed in soft leather jackets, with sweaters and jeans in quiet colors. But we were told that the universities have no money, the teachers have no money and the students have no money. Nor were there any jobs waiting for the students when they graduate.I felt strange to be thinking of my father, who was also a poor young Odessa student walking these same streets long ago. My father, Jacob Ladin, who died in 1980 with his children and grandchildren around him, had become a respected and prosperous businessman in America. But in 1917, my father was a penniless 17-year-old student, working in an Odessa factory by day to pay for his night classes.In 1917, Russia and Ukraine were bleeding to death from their losing a war against the German and Austrian empires. Tsar Nicholas II was a weak man, father said, ruled by the reactionary Empress Alexandra. She in turn was under the thumb of the crazy monk Rasputin. The Tsar was deposed in the March 1917 revolution and replaced by a democratic government. “Oh, that was great!” father had said. “The flags were out, new elections were organized. All of a sudden we knew what freedom was!” But in October 1917, Lenin overthrew Russia’s first democratic government and installed his communist dictatorship.Then, as father had told me, the Reds occupied Odessa in January 1918, supported by the Black Sea Fleet with a destroyer and other ships ready to bombard the city. The Reds had tied weights onto the ships’ officers and threw them overboard. “Then the Reds declared themselves in power,” father said, “and took over the city. Many people joined them. I went to the city hall, and there I saw my Latin teacher, and now he was a communist official!”Then they took many of the town’s rich and dumped them in the bay, killing hundreds, he said – anyone who might be against them.Soon there was nothing he could do in Odessa; the schools were closed, the factories were closed. Sometimes there was food, and sometimes not. He couldn’t escape, he said, because all the neighboring countries had sealed their borders to keep out the communists.In the chaos of the Russian civil war, three different marauding armies began to battle for the Ukraine, each one plundering and massacring civilians. There were the Whites, who were loyal to the Tsar, the communist Reds and the Ukrainian Nationalists, who led anti-Jewish pogroms. Hundreds of thousands died from famine and violence. Father was first drafted into the White army and then the Red. He could not escape abroad until 1920, and he finally arrived safely in America in 1921. Back on our ship, Anneliese said she felt like she was re-entering a different peaceful, comfortable world. For dinner that night, we had creamed vegetable soup, grilled chicken livers on toast with bacon, and roast lamb served with creamed lentils and red cabbage. Dessert was mascarpone cream with cherries, coffee and four kinds of cheese. All excellent.Later that night we heard the Odessa String Quartet in the Tchaikovsky Salon, led by Professor Serge Scholz, an elderly white-haired cellist, who has played not only in the Odessa Opera House but also in Hall and the Kennedy Center. Our Viennese audience was entirely attentive throughout the two-hour concert of Mozart and Tchaikovsky, and gave professor Scholz a special hand as the quartet left. It’s very well-known, Anneliese said, that many of the greatest musicians have come from the Ukraine.Afterward, Anneliese and I tried to gather our thoughts about what we had seen. Anneliese said that she found Odessa to be an exotic and intriguing city, but the poverty was very sobering. In many ways, I said, the economy and the standard of living have declined since Soviet rule ended in 1991, hard as that is to believe. People tell us, I continued, that Ukraine’s rich are all thieves, and that the corruption is horrendous. Cruise Director Nicolaus said that 90 percent of the richest coal mines are owned by former government officials in Kiev, and that the Ukrainian steel mills are in the pockets of the same robber gang. He said that the mayor of poverty-stricken Odessa rides around in a Rolls Royce. We’ve heard, too, that there are 100,000 university students and no jobs for any of them. Anneliese, I said, we have here in Ukraine a large educated class without a stake in the country, without jobs, without political power. That’s a classic scenario for a revolution. If I were a government official in Kiev, I would be worried. We can only hope that these people have the courage to demand a better future for themselves. In December 2004, the revolution came to pass.Larry Ladin was a closet writer while working in the computer business, but came out of the closet when he moved full time to Aspen/Snowmass in 1986. He is a past president of the Aspen Writers’ Foundation.